Lyndsey Knight is a Melbourne-based artist and graphic designer who runs her own online business. While she always dabbed in the creative aspects of business, it wasn’t until 2016, that she truly found a job she loves – owning and running Knight Creative. 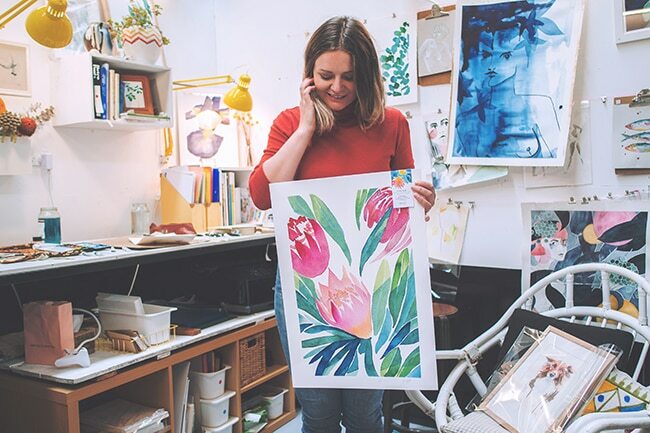 To find out more about life as a self-employed entrepreneur and creative, we sat down with Lyndsey to hear more about her story. I grew up in rural England, before moving to Australia in 2012. I adore Australia’s natural beauty — every chance I get I drive to the coast to be by the ocean. Being around nature grounds me. This might sound silly, but the sky is bigger here. When I first moved to Melbourne I didn’t know anyone, and soon realised that there was no one holding me back but myself; there were no excuses for not following my dreams. This beautiful country gave me the space to be the creative person I’d always dreamed of being. I dabbled in freelance graphic design, alongside styling, marketing and sales jobs since university, but I’d say my real entrepreneurship journey actually started with a bread business. My partner Scott and I started a Scandinavian baking company in 2015 selling dark rye breads to Melbourne’s food markets and cafes. It was fun but exhausting — lots of early starts and late nights. After 12 months of commercial kitchens and van deliveries, I realised I enjoyed the branding and creative side of the business far more than baking. Now I have an art studio in Preston, and, alongside my freelance graphic design and illustration, I’m making art and running an online shop. I’ve finally found my thing — a job I love — and it’s addictive! What was the biggest hurdle when starting your business? Definitely money. Cash flow is tough, and some months are still hard to buy bulk stock in advance, or art prints before a new series drops. With planning and budgeting I’m more confident. I love being in a creative space — there are nine artist studios where I work — we all collaborate and support each other. The satisfaction of making something from scratch with your own hands is unbeatable, too. It’s a beautiful feeling. I know I’m up against so much mass made art, so I do everything I can do to make my customers smile. Whether that’s chatting about their dog at a market, sending a personal email to make sure their gifts arrived, or creating custom artwork. I wrap every order with care and include handwritten thank you notes, popping in extra little surprise products sometimes, too. You use QuickBooks to manage your business finances. Why? I was very overwhelmed when I started, and Quickbooks made it really easy to see where I was at in a glance and organise my accounts. It’s also priced very competitively, which makes a big difference to small businesses. What features of QuickBooks do you love? I love the automatic reconciliation — it’s very satisfying. I also love to make rules for banking feeds so my transactions can be entered very quickly. I despise paperwork and clutter, and having a digital solution means it’s all in one place. What’s next for Knight Creative? I hope to expand my range; printing my designs onto clothes and homeware. I’m currently releasing a line of purses! A collaboration with another designer or brand would be epic. It can take years to get established, so don’t give up hope. Also start with a firm business plan (I learnt that one through my own failing). Keep asking questions. Keep learning. Keep your eyes open. Keep smiling. You may have to work very hard, and put in long hours, but it’s so worth it in the end.